I have shared my sister in law's awesome gardens before on my blog. She is a garden junk artist, with a very green thumb. 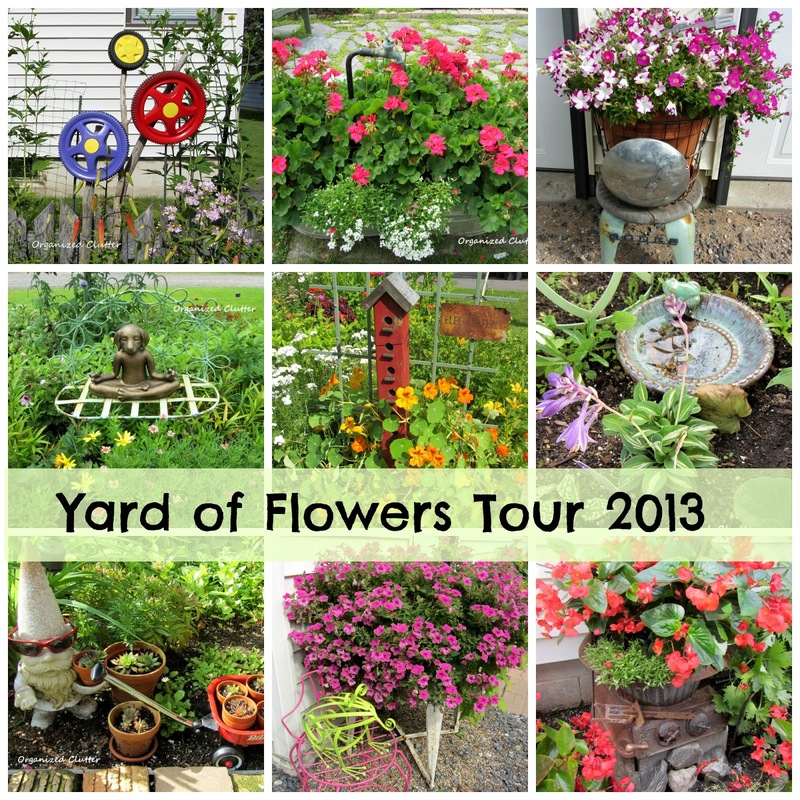 If you took the Yard of Flowers 2013 Garden Tour, you will likely remember this fun old rusty gear. It's always on one end of a fun garden path in my favorite garden in my sister in law's yard. Can you tell it has changed since last year? No tin in the path this year. It's back to bricks and rocks, each one strategically placed. Plants and junk intermingled with ease! Beauty and interest at every turn! Just look at this path! Hammered blue tin edges low growing annuals and perennials and more bricks! More hammered tin in the wood planter. It's a riot of color and textures. There's even a rusty "Island Girl" planter. Another angle of the island bed. More of the hammered tin planter made by my sister in law. Here we are back at the beginning, under the iron rose arbor. Oh how I love junk in the garden..........beautiful! What a fun garden and slouch beautiful flowers! She truly is a master gardener in my eyes. Gorgeous with all the little touches of whimsy thrown in. What a delight. Wow...your sister is a fabulous garden junker....as are you! SO,so beautiful, it's hard to take it all in. A really nice selection of flowers and beautiful artful junk. I keep going back to take another look and each time I see something I missed before. Gorgeous, thanks for sharing. Beautiful! I'm trying to start a fun collection...I wish I had some (ok, all) of her stuff! Love it, just so pretty. I love how she has it all working so well together. Such a talent. I love it!